Laci Muhlenkamp reads her award-winning essay at Thursday’s Highland County Drug Abuse Coalition meeting. 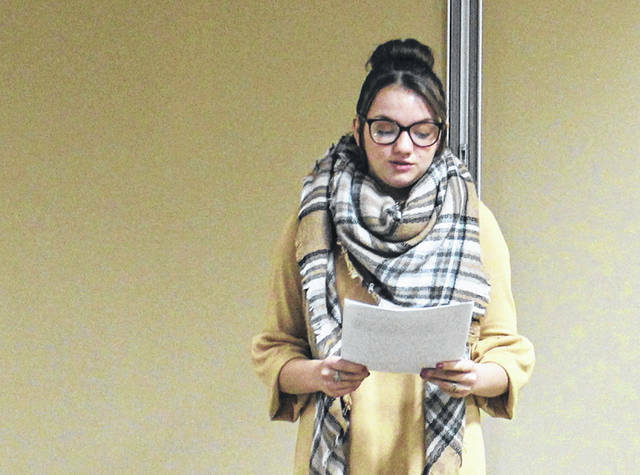 Laci Muhlenkamp’s thoughts on substance abuse, penned in red ink for a local essay contest, won the Fairfield High School student a $500 scholarship recently — and had several people close to tears Thursday when she read them aloud at a meeting of the Highland County Drug Abuse Prevention Coalition. Muhlenkamp, 15, was given a round of applause after presenting the essay, which she entered in the Paint Valley Alcohol, Drug Addiction and Mental Health Board’s “Write in Red” essay contest for Red Ribbon Week this year. ADAMH board Executive Director Penny Dehner fought back tears as she congratulated Muhlenkamp. Dehner said the subject matter “really touches my heart,” adding that the community “has to do better” at supporting those struggling with drug abuse. The contest is connected to Red Ribbon Week, a yearly drug abuse prevention campaign that takes place in October, and challenges students in the board’s coverage area to write an essay about the implications of substance abuse. A winner is selected from each county, and Muhlenkamp took the honors here. Dehner said the essays submitted in the contest are often “hard to read” because the young writers are so vulnerable about their experiences with drug abuse. Heather Gibson, a former president of the coalition and CEO of local nonprofit REACH for Tomorrow, said the essays break down stigma surrounding children affected by drug abuse. Every year, we, the students at Fairfield, are asked to write Red Ribbon Week essays. Every year, the topics are similar. I do the same topic every year: Why are drugs, alcohol and tobacco dangerous? Every year, I set it up the same way: Drugs, alcohol and tobacco all have their own body paragraph and I throw in a statistic here and there. This year, however, I’m going to write about real life: why drugs, alcohol and tobacco are actually dangerous. When it’s personal, statistics and formality aren’t really relevant. Firstly, drugs, alcohol and tobacco are dangerous because of the changes they make to your mind. Ask me a year ago what drugs do to your mind, and I would’ve been ashamed that I had witnessed it firsthand; I would’ve been ashamed that it had been a leading factor in the destruction of someone I love dearly. I would’ve responded with a very generic and ignorant answer. But now, I’m not ashamed. The truth about what drugs do to your mind is this: All sense of who you once were isn’t gone, but everything you previously cared about is no longer that important. Priorities that you and I see as no way dismissable can become nothing to someone who is using. This loss of direction seems to happen like falling asleep: slowly, then all at once. But it isn’t a blissful ignorance, as it may seem to people who don’t have personal experience. People who use harmful substances still have their identities. Many people say that people who use are no longer themselves. That’s incorrect. They still have themselves, and that’s the hardest part. Using is a constant internal conflict for someone. They’re still a parent, or an uncle, or a friend. But, they’re also someone who’s lost focus, someone who’s lost motivation, and eventually everything they’ve worked for and everyone they care about. Maybe they were on the road to success or the path to failure. That’s the catch, though. It doesn’t matter. Addiction isn’t something that says, “Oh, you have kids to raise,” or “Well, you’re so young. How will this affect your life?” It just happens, and from that point on, every time the bottle is empty, every time the drugs are gone, every time you look up, there is less there. So, mentally, it isn’t about how drugs interfere with the way the neurons send and receive signals via neurotransmitters in the brain. It’s about how a human being, once full of life and passion, becomes unrecognizable; becomes a stranger to the people who know them best. This is the worst thing about anything that’s self-destructive. It’s so intimate. You become so close with your addictions and illnesses that leaving them behind is like killing the part of yourself that taught you how to survive. Then, there’s the physical effects. These are sometimes irreversible, so if you are strong enough to get sober, you are still reminded of that time in your life. If you aren’t so lucky, you could die; very blunt, but true. You could be the most beautiful person in the world, you could be full of energy, “bright-eyed and bushy-tailed.” But, just like that, you can age 15 years in one. Of course, at that point, vanity isn’t really a concern. Some additional physical consequences include damage to all your organs and internal systems, cancer, skin lesions, needle marks and collapsed veins, jaw and tooth complications, and, if you’re pregnant, harm to your baby. There’s also indirect physical risks. For instance, if you’re under the influence, you make yourself vulnerable to sexual assault, and you take a chance of harming others. So, physically, you not only have a reminder to yourself, an indicator to others, but your body is never the same as it once was. Lastly, both the easiest and hardest part to write: how drugs, alcohol and tobacco are harmful to those besides the user. Think of it this way: When you were a young child, you depended on your parents for everything. You needed to get up on time, you needed to be watched over, provided for, tucked in. You depended on your parents to love you and guide you. Now, reverse the roles. You’re learning sight words and what two plus three is. But, when you come home, you’re learning how to nurse a hangover. You wonder if you’ll eat or if you’ll see something you can’t unsee. Most importantly, you wonder what you can do to make things better. Nothing. Absolutely nothing. And that conclusion right there takes years to accept. You can also look at it from the point of view of a spouse. Say you marry someone stunning, intelligent and insanely quick-witted. Then, they start using. It’s nonchalant at first. Then you notice the person you love is a different version of themself. This version doesn’t care. This version is there, but not present. But, you still love them, you continually hope and think that things are better when they aren’t. The closer you are, the worse it hurts. Then again, you may not know them at all. They might just be a name and a face that was driving under the influence and killed your loved one. A total stranger who turned your life upside down. Someone who uses is comparative to a bomb. Sometimes, they are disarmed, and people sigh a sigh of relief and go back to living their normal lives. Other times, everyone and everything in the wake is destroyed. And while you can rebuild, there’s always something left behind. So, in conclusion, drugs, alcohol and tobacco are dangerous because they negatively affect everything and everyone involved. Sometimes, the effects are small because change is put in place and people get better. Other times, it’s too late. But, the most important thing that someone can take from this isn’t that you feel bad or pity people dealing with it. It’s understanding that these substances actually change people’s lives. Realistically, people will do as they please, but one person you’re in control of is you. It takes real life to open people’s eyes, and in writing this essay, I probably haven’t done anything but get a grade. But, on the off chance someone’s perspective or even thoughts changed just a little, I’m glad I wrote it.